A group called Manilakbayan 2015, also known by some the "Lumad caravan," are in Manila for a month-long series of activities and protests to bring attention to human rights violations in indigenous Lumad communities of the Philippines. Some 700 Lumad, indigenous peoples who inhabit the Southern island group of Mindanao in the Philippines, journeyed together with their church-backed supporters from Mindanao to Manila, the World Council of Churches reports. Travelling from Surigao City to Eastern Visayas, before crossing to Luzon, they arrived in Manila on a Sunday, Oct. 25, a week after leaving their home communities. "The continuous struggle of the Lumad in Mindanao to defend their ancestral domain is a struggle for life, as land for them is life," said Fr. 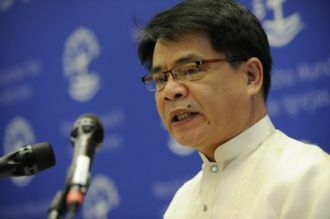 Rex Reyes Jr., general secretary of the National Council of Churches in the Philippines and a member of the WCC's main governing body, its central committee. "In journeying with the Lumad, the NCCP has been prayerfully undergirding and supporting their struggle for land, life and self-determination," he said. Mindanao is rich in mineral resources, densely forested and has other natural bounty. However, large-scale mining by corporations, plantations and other extractive projects are reportedly fueling and financing the militarization of the region. (Photo: WCC / Athena Peralta)Filipino church leader Fr. Rex Reyes speaking at a World Council of Churches event in Geneva, Switzerland in 2014. Local human rights organizations such as Karapatan, say more than one thousand Lumad families (or more than 4,000 people) have been forced to abandon their ancestral lands and are now living in evacuation centres. Attacks on schools (burnings, raids, harassment and intimidation of students and teachers) run by Lumad and non-government organizations have taken place. Around 56 Lumad leaders and environmental activists resisting large-scale mining projects in Mindanao have been murdered since 2010. The National Council of Churches in the Philippines condemned the recent killing of Lumad community leaders Emerito Samarca and Dionel Campos in a statement issued on Sept.1. The Manilakbayan 2015 is an expression of the WCC's world-wide Pilgrimage of Justice and Peace. 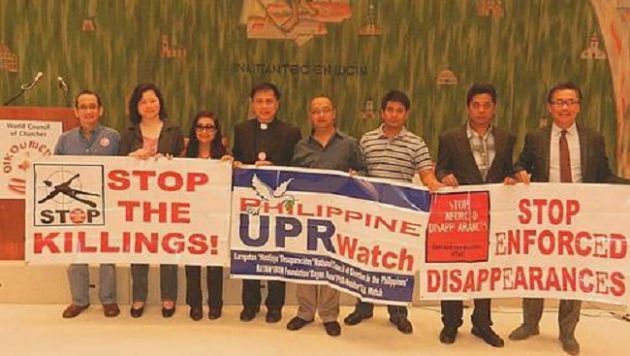 "We welcome the Manilakbayan, the Lumad, the Moros and human rights advocates from Mindanao whose unrelenting hope is admirable," said Norma Dollaga, general secretary of KASIMBAYAN (formerly Ecumenical Centre for Development) and a deaconess serving the United Methodist Church in the Philippines. "They impart upon us so many things: to trust their dream and live out its fulfilment; never to give up the fight for one's dignity and rights; to cry out, to shed tears and to carry on what their martyrs and heroes have fought and died for," she said. Dollaga said they "express their anger, fears, and challenges with authenticity; to sing their songs with honesty, to dance the music and rhythm of their struggles, joys and hope."